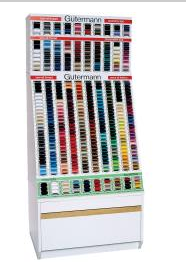 GUTERMANN-Top Stitch Heavy Duty Thread is a heavier weight thread ideal for bold decorative sewing; button holing; and button sewing. Best results are achieved with Top Stitch in the needle and Sew-All in the bobbin. If you try to wind the heavier thread on your bobbin it could mess with your tension and that can be an expensive mistake. 100% polyester; 33 yards per spool. We carry a rainbow of colors, a shade for every project. We have 30 shades of Topstitch thread. We will be uploading a shade card, but in the mean time, you can tell us to match a fabric you are ordering and we will choose the best match for you, you can specify a color or if you have a spool you have used up just reference the color number.